Vanguard looks through a music store and picks out a number of CDs to purchase but an explosion outside draws his attention. 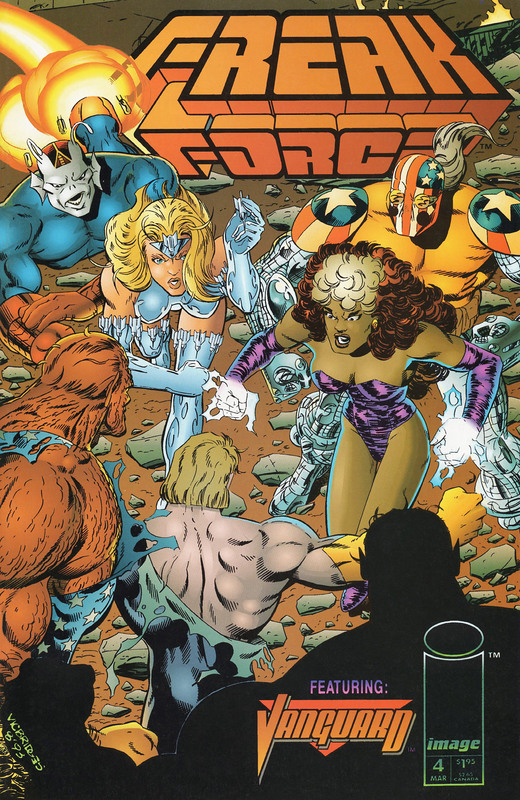 He decides to investigate and flies over to the battle scene where the Mighty Man clone begins to slowly pull on the helpless Ricochet’s arms, dislocating one of her shoulders. Before the villain can threaten any further, Vanguard flies into action but Mighty Man turns around and knocks him back into a wall. The Barbaric Twins emerge to take over the fight with Vanguard which leaves Dart and Rapture facing down the evil Mighty Man. Over at Hillman Hospital, Ann Stevens deals with the injured being brought in after the gas main explosion. Sam Haze reports that Mighty Man seems to have gone bad and is tearing up Chicago, something that alarms Ann. The battle is also watched by Chelsea Nirvana who then arrives at the hospital to visit with her comatose father. Dr. Nirvana is the former nemesis of Mighty Man and has been comatose for some time now. In a move that surprises Rapture, Dart volunteers to deal with Mighty Man on her own and proves her worthiness by using her fighting skills to avoid his attacks. Rapture unleashes an electrical strike upon one of the Barbaric Twins and is surprised when he explodes as random genetic material. SuperPatriot arrives and joins the fray in time to witness Dart use a nerve strike on Mighty Man that causes him to also explode. He then assists Vanguard who delivers the killing strike to the final Barbaric as he flies directly into him and is covered in the resulting bloodied mess. The mayhem continues to be reported by Sam Haze who mentions that the property damage will likely cost several million to repair. The cost in human lives will likely run much higher and it is wondered where the real Barbaric and Mighty Man were during this affair. Barbaric wakes up from a long sleep after having stayed up all night to watch television. He apologizes to Ricochet who is being treated at Hillman Hospital for her shoulder injury. Chelsea is enraged that her Evil Clones degenerated into their original genetic material and blames her father for creating a machine that was faulty. She berates the latest in a long string of failed projects created by Dr. Nirvana. The evil woman then scratches her father’s head before punching his comatose body out of bed and onto the floor. She then departs, claiming to love him still.